This guide has been written for customers or future customers of Postmates app. Postmates is a technology platform. Postmates has transformed commerce in cities. It uses logistics services to helping customers get whatever they need, whenever they need it. Postmates was founded in San Francisco in 2011 by Sam Street, Sean Plaice, and Bastian Lehmann. Postmates operate in in +250 U.S. cities. Postmates grows fast, since November 2017 anyone in Honolulu can order anything from all of the local-approved hotspots day or night. Postmats launched the first international market Mexico City with over 1,000 local partners. Like other companies based on new technologies, even for Postmates everything works via an app, in this case Postmates app. Postmates app uses location service through your smartphone but gives you the flexibility to choose and set up any adress you want. You are at work, on vacation, you want to have a gift delivered...with Postmates app is easy. 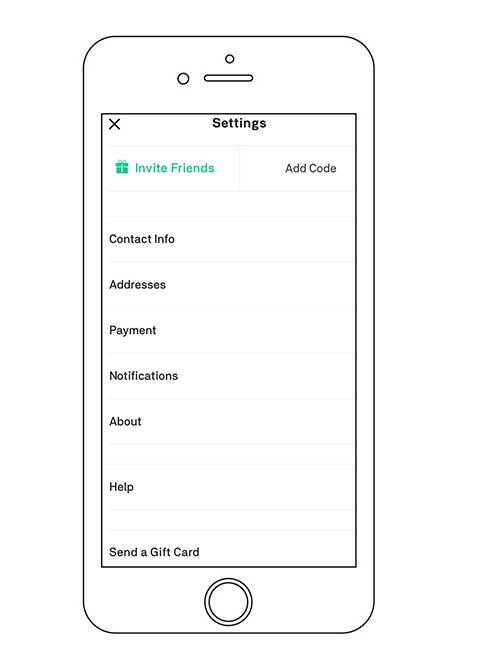 The settings menu of Postmates app is easy to use and allows you to manage your contact information and to set up different addresses for the deliveries, to set up your payment information and of course to share your Postmates referral code. Here some examples in images for you. How to pass an order with Postmates App? From your favorite drink to your favorite restaurant (Mexican, Chinese, Japanese, Italian or...) to the clothes you prefer. There is a big number of choices with Postmates app. The first thing to do is to etablish the place of delivery. One of the advantages of using Postmates app is that you can enter and change the delivery adress. Below is an example in images on how to change the delivery address. Click on the arrow next to the current location. At the bottom of the screen will appear a menu. 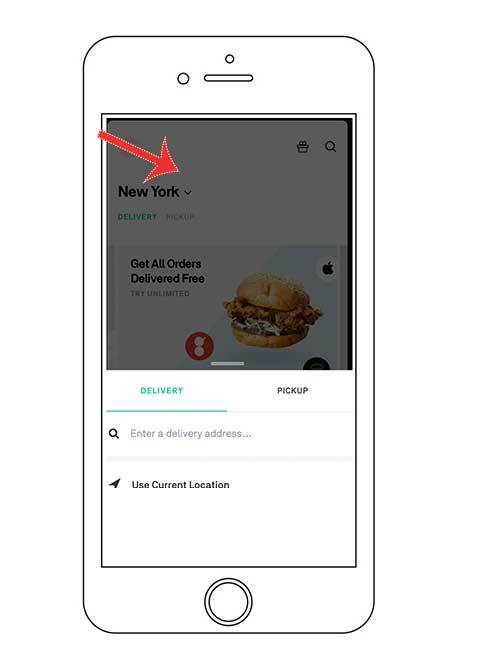 You can write the new delivery address or indicate to Postmates app to use the current location. Postmates app offers for you some shopping options. You can make choice by category or if you want to search for a specific store or good you can use the search box located in the upper right corner of the app. 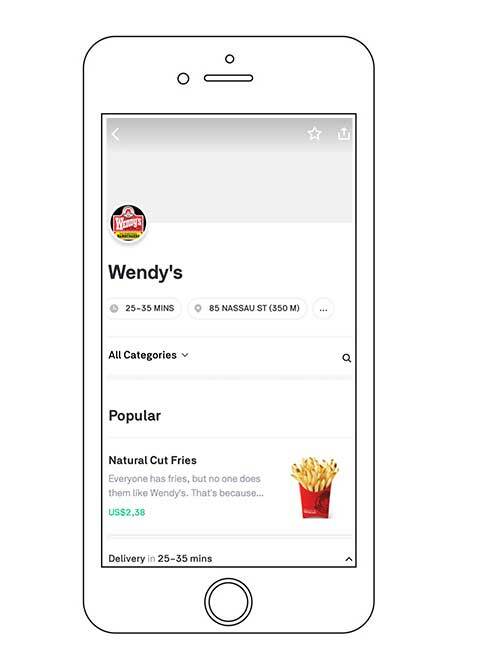 If you are looking for an hamburger for example, Postmates app will list for you all the possible choices with the time of delivery. After having selected your restaurant (or store) the menu (or products for sale) will be listed in the app with their respective price. You can now simply add any items you want to your cart as you normally do for your online shopping . Before confirming your order, you will see your total amount including delivery fee. After confirming, your card will be charged only with the amount of the goods and the fee of delivery if applicable. You can follow the status of your order, track your Postmates courier location and the extimated delivery time directly through Postmaes app. Postmates drivers have the possibility to contact you (call or text) for any problem or question concerning the order. Postmates is unique in its sector, in fact other delivery apps only offer food delivery services. However if you are intrested in having a comparaison with other food delivery app, here is one. In some big cities including San Francisco, Postmates has a new pick up service. This service is totally free and allows you to place an order through Postmates app and pick up it avoiding line. Useful, no? UberEats is the food delivery app of Uber. Like Doordash they focus on delivering food orders from local restaurants to customers. Restaurants are looking for the way to increase their revenues and to keep thei business profitable. Postmates, UberEats or Doordash app are a solution. UberEats services are available in different cities in the United States of America, in Europe, Australia and New Zealand, Asia or South Africa. The way of the two apps work is always the same, submit an order with UberEats app is easy. 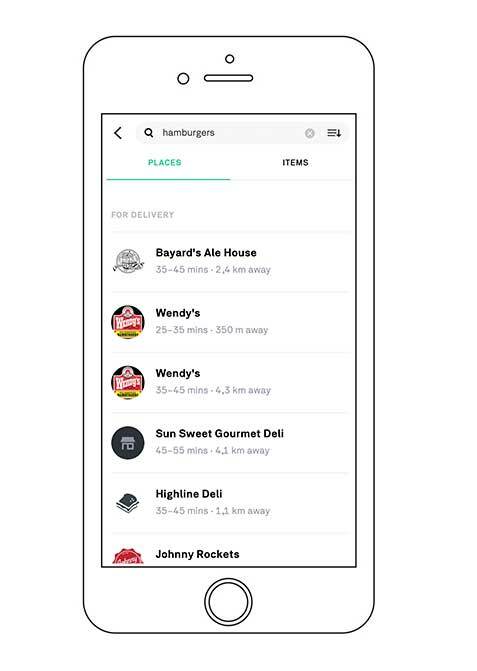 Customers simply peek a restaurant through hundreds of restaurant listed on the UberEats app. As with Postmates and DoorDash, customers place their order and pay directly through the app. Postmates, UberEats and Doordash app, allow you to track the location of their delivery driver in real-time. With UberEats sometimes you will pay a fee for busy areas. When there are more orders in a certain area than delivery partners, UberEats apply this extra fee to ensure that you can still get the food you want whan you want. Grubhub, like Doordash and UberEats is only food delivery app. GrubHub was founded in Chicago and recently merged with another food delivery service Seamless. You can pass an order with GrubHub app in U.S and also in London. Grubhub lets users review restaurants, this is an incentive for restaurants to give the best. As well as Postmates also Grubhub offers the pick up service. Unlike Postmates, however, many restaurants require a minimum of expense to place an order. Can I Pay my Postmates Order with cash? Is a Tip automatically Included in my Postmates Order? No, tip is always a customer choice. Your card will only be charged with the cost of the goods you have ordered and of delivery fee if applicable. How Does Tip work with Postmates? After your order has been delivered, you will receive a notification in the Postmates app asking you to rate the Postmates driver. You have the possibility, if you want, to leave a tip for the driver. As we said, Tip is not mandatory. 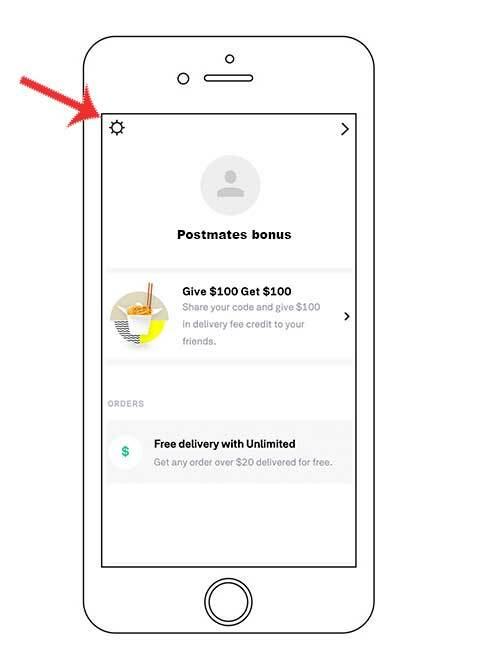 Postmates app calculates 10%, 15% or 20% or the orther. You can also enter your desired tip amount. How Do I Cancel a Postmates Order after I passed it? You can cancel an order made with Postmates, at any time, through Postmates app or Postmats website. Tap the “Help” option from the order status page, at the bottom of the screen, a submenu with two options will appear. Click on “Cancel Order” from there and select the reason for cancelling and press continue. Login in your Postmates account in the Postmates website. You need to click on the help buttom from the order status page, select cancel your order and select the reason for cancelling. Please note that depending on when you cancel your order, you may still be charged some or all of the order cost. #1 the Postmate (Postmates driver) hasn’t arrived at the merchant yet: You can cancel the order directly through the app at no charge to you. #2 the Postmate is on the way to pick it up: you’ll pay for the items and a cancelation fee to cover the cost. Since the service was not completed, you won’t pay the Delivery Fee or the Service Fee. #3 the order is on the way to you: Postmates will need to charge you the full price for the delivery at this point which includes the items, the Delivery Fee, and the Service Fee. Safety is extremely important to Postmates, obviously Postmates is a secure platform and they screen all of Postmates'candidates with thorough background check. Postmates reserves the right to disqualify a driver if their background check reveal any disqualifying offense in the last 7 years or for any other safety-related reason. 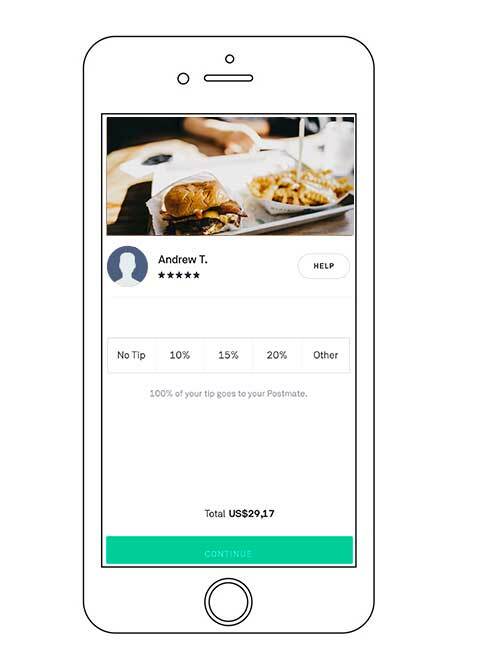 All payment transactions, including tipping, are processed automatically on your payment card through the Postmates app. This means you will never need cash on-hand. The mobile numbers shared between customers and Postmates are masked so that real phone numbers are never exposed. Does Postmates Offer Free Delivery? 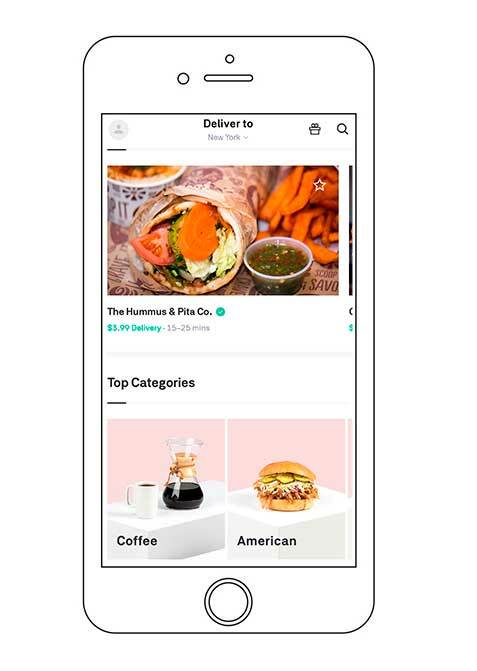 After dowloading Postmates app, you will receive several offers from Postmates of free delivery for some specific days or for purchases made in certain marchants. Do not forget to take your Postmates $100 code. It will gives you $100 free delivery fee credit. Our Postmates promo codes are always valid and have no expiration date. Do you have a question on Postmates? We have the answer 😉. Browse our website, we know Postmates... you can also send us your questions by mail. We are a helpful community of Postmate! If you prefer you can ontact the Postmates Support team through the Postmates app or through the website.